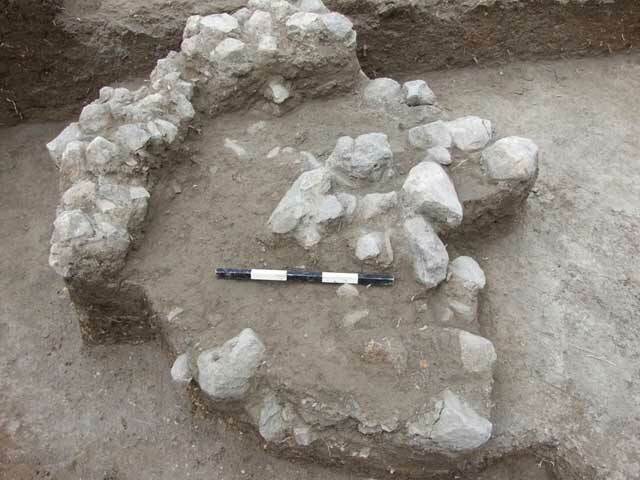 During March–April 2011, an excavation was conducted at Tel ‘Afula (Permit No. A-6156; map ref. 227399–476/723573–655), prior to construction. The excavation, undertaken on behalf of the Israel Antiquities Authority and underwritten by the Esh Tordiya Investments Company, Ltd., was directed by N. Feig (surveying and field photography), with the assistance of A. Hassan (administration). The excavation area was located on the southern peak of Tel ‘Afula, which extended across c. 30 dunams; however, only a small section of the tell has survived due to development and construction work that had been carried out at the site from the time of the British Mandate until the present. The elongated tell, rising to an elevation of c. 20 m above sea level, had two low peaks. Only the southern one has survived and upon it a Crusader-Mamluk fortress is standing. The excavation was conducted c. 10 m west of the fortress. The first excavations at Tel ‘Afula were conducted by Sukenik in 1948 and settlement remains dating to the Late Chalcolithic–Early Bronze Age were exposed (Sukenik E.L. 1948. Archaeological Investigations at 'Affula. JPOS 21:1–78). Tombs from the Early Bronze Age, Middle Bronze Age II, Late Bronze Age–Iron Age I and Roman period were found in the vicinity of the municipal water tower. Sukenik exposed the Crusader-Mamluk fortress on the southern peak of the tell and excavated a Byzantine olive press and evidence of a settlement dating to the Early Bronze Age in the region of the northern peak. In 1950–1951, excavations were conducted along the northwestern slope of the peak and a pottery workshop for Tell el-Yehudiyah ware from Middle Bronze Age II and another pottery workshop from Middle Bronze Age I were discovered (Dothan M. 1956, The Excavations at ‘Afula. ‘Atiqot 1:19–70). In the 1990s and during the past decade several small excavations were carried out and an uninterrupted sequence of settlement remains from the Chalcolithic until the Late Byzantine periods and remains from the Mamluk period were exposed (HA-ESI 114:27*; ‘Atiqot 30:25–67; HA-ESI 121). Five squares were opened in the current excavation and two main strata were exposed; Stratum I dating to the Roman period and Stratum II—to Early Bronze Age I.
Stratum II. Concentrations of pottery dating to Early Bronze Age I are ascribed to this layer. Noteworthy among the finds are fragments of gray burnished bowls that were recovered from a tamped earth floor in the northern and eastern parts of the excavation area. No walls or architectural elements were found in this layer. The potsherds from this period and from Early Bronze Age II were found scattered throughout the excavation squares, mainly below the installations of the Roman stratum. 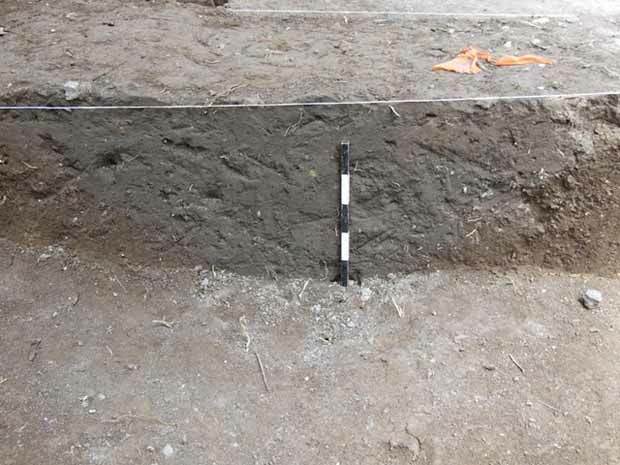 Stratum I. Pits (depth of each 0.30–0.45 m) were scattered throughout the excavation area. These were characterized by semicircles constructed from small stones or several large flat stones (installations? ; Figs. 1, 2). Remains of a small stone surface, which was a kind of pavement, were visible in one of the shallow pits (0.2 m; Fig. 3). 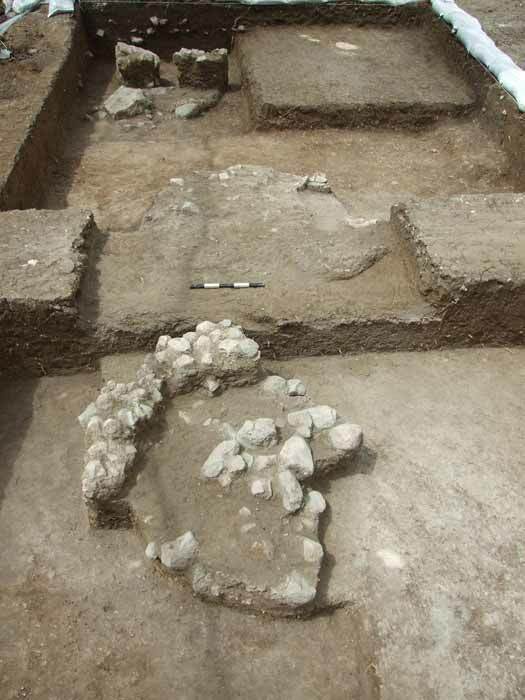 A burnt layer (thickness 0.2–0.4 m) was in the vicinity the pits, which contained mainly fragments of cooking pots and jars dating to the Roman period (second–fourth centuries CE; Fig. 4). 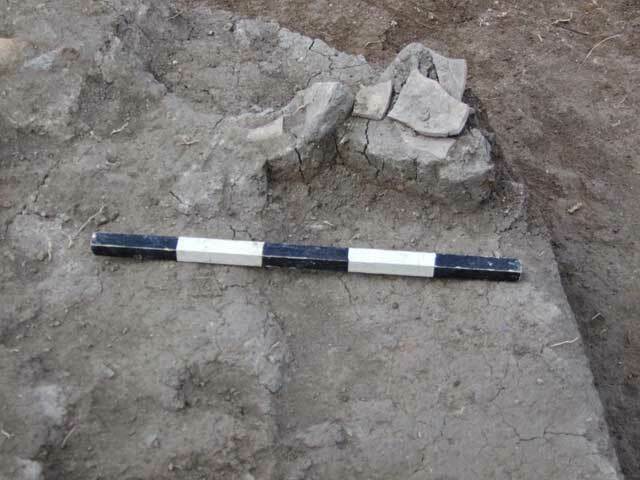 Owing to the poor preservation of the pits, it was not possible to determine their function; however, based on the burnt layer around them and the nature of the finds, it seems that they were used for cooking. The construction activity from the 1950s probably resulted in the destruction of the settlement layers on the tell and all that was left are meager remnants indicative of a settlement from Early Bronze Age I and the Roman period. Pottery from Early Bronze Age III, Iron Age I and a single Hellenistic Attic fragment indicate that a settlement was situated on the tell in these periods. In addition, fragments of glazed bowls from the thirteenth century CE (the time of the fortress) were found along the southern edge of the excavation. 1. Pits in the northwestern area, looking east. 2. Outline of a pit in the section, looking north. 3. A round installation, looking west. 4. A smashed Roman jar, in situ, in a burnt layer.